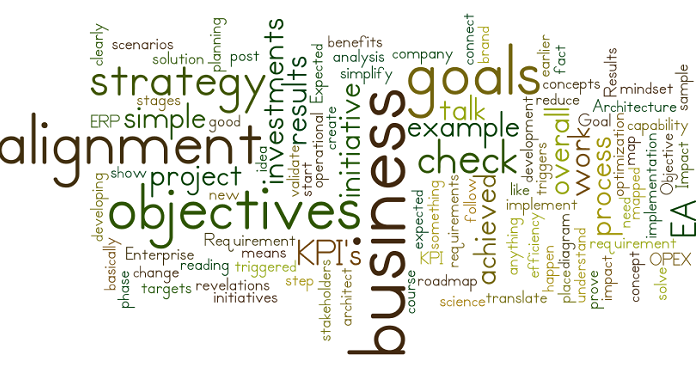 Today, I am going to talk about business objectives and the alignment with IT. The core concept under this alignment is the optimization on the IT investments and overall solution concepts. But from where are they come? First of all, we have to clearly determine the business strategy. And you don’t have to think that you need rocket science for that. You can start with some targets, like “operational efficiency”, or “reduce OPEX”, for example. These triggers shall be the “revelations” for goals and objectives used in Enterprise Architecture (EA). Through the EA, you guys are able to “check” and “validate” the alignment of your IT initiatives and the business strategy. Let me show you how, with a sample (and simple) diagram. Impact: Then, we have to understand what it means for the company. What is going to happen if I try to implement my requirement. Expected Results: The next step, is to map the results expected from the impact mapped. KPI: As a good architect you are, of course you will create KPI’s to be sure that the results are achieved, in fact. Goal / Objective: And finally, with the KPI’s in place, you will be able to check if your goals were achieved. The beauty on it, is that you will connect the business requirements with the strategy in the earlier stages of your initiative, which will bring a brand new mindset during the analysis phase, and the overall development of your project, roadmap, or anything else you are planning to do. But, notice that we have a box, that doesn’t have any connection, in the “Expected Results” lane. On this example, it means that the result doesn’t have any connection with the business goals / objectives, which implies into a problem. I mean, if we decide to go ahead with this requirement, without mitigate the results and impacts of it, we will harm the company strategy, in some way. This simple check will help you – and the stakeholders that work with you – to follow and pursuit the same goals / objectives while developing something. From an idea to change a business process, to an ERP implementation, this alignment will give you the capability to translate and prove the benefits on your work. In my next post, I will talk about IT investments, and scenarios triggered by goals / objectives. Posted in EA and tagged modeling, strategy. ← Why to use Enterprise Architecture?